I don't usually post reviews on DVDs Blu-rays I watch at home, but I feel like I have to post a quick rant today about a film I rented last night that angered me to no end. 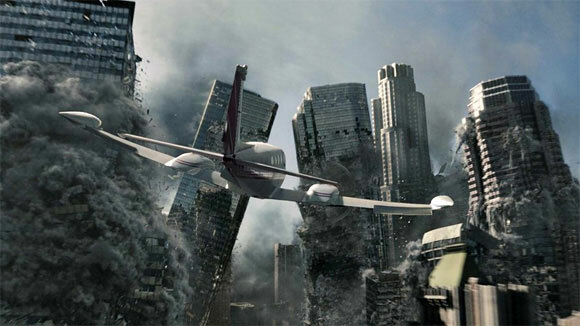 2012 is the latest disaster movie to come from the "creative" mind of Roland Emmerich. I knew going in that I would be watching the same tried-and-true formula that Emmerich has used in his earlier films. What shocked and appalled me is how little this movie differs from his earlier work. You'd think that as you grow as a filmmaker and producer, you'd try new things or branch out with some original ideas. This is definitely NOT the case with ol' Roland. Independence Day (1996 - and my all-time favorite Emmerich movie): An alien invasion threatens the entire world and causes mass destruction. The government knows about it but keeps it under wraps from the general public. Washington D.C. and New York City are destroyed. Godzilla (1998): A large reptile creature threatens the entire world and causes mass destruction. The government knows about it but keeps it under wraps from the general public. New York City is destroyed. The Day After Tomorrow (2004): A global climate event threatens the entire world and causes mass destruction. The government knows about it but keeps it under wraps from the general public. Washington D.C. and New York City are destroyed. 2012 (2009): The warming of the Earth's core threatens the entire world and causes mass destruction. The government knows about it but keeps it under wraps from the general public. Washington D.C. and Los Angeles are destroyed. The Patriot, Stargate and (presumably since I didn't see it) 10,000 B.C. are the only exceptions from Emmerich's disaster formula. Each of the four movies above feature a broad cast of bit players that are conveniently located in multiple cities that are crucial to the "plot". I can't even really label the story of an Emmerich movie as a plot because it is just fuel for getting to the scenes of destruction. Supposedly, he's working on two sequels to Independence Day. I loved the first one (not realizing it would spawn three clones down the line), but do we need two more movies that feature the same old Emmerich crap!? I guess if Will Smith and Jeff Goldblum is on board it could have some redeeming value. As for Roland's latest destructo-fest, 2012 is a terrible film. I completely gave up on this movie once I saw John Cusak run from earthquakes and volcanos and barely escape just in time. I can understand the premise that the Earth's crust is disrupted, but it wouldn't possibly just cause mass plate shifts that go from a destruction level of 1 to 10 in a matter of minutes. Everything happens too fast in this movie and chaos is instantly created. Cusak (who must be hurting financially to accept this role) and his family actually escape rapidly moving sinkholes, fires, ash and other elements in an airplane as it tries to take off MORE THAN TWICE in this film. Cusak drives through the mid-floors of a building in a limo AS IT IS BEING DEMOLISHED like the World Trade Center. For Emmerich's next movie, he should just save on production time and put together a short 30-minute film sequence of the top 20 world landmarks getting blown-up one after another. I would actually pay to see that because I wouldn't have to sit through 2.5 hours of painful acting that surrounds a typical Emmerich film. This movie was so much like The Day After Tomorrow that I feel like I need my rental money back because I actually paid to see TDAT in the theater. The fact that my Dad really liked this movie scares me. I'm hoping he didn't see The Day After Tomorrow, otherwise I don't think I can trust his taste in movies anymore. One JR for me on this piece of crap. The only redeeming feature of 2012 is the special effects which are well done even if they are WAAAAY over the top. I also liked Independence Day and The Day After Tomorrow wasn't bad. Every other one of his films was terrible and the dialogue could have been written by a 12 year old. No offense to 12 year olds.